How many weddings have we been to, People? And how many times have we suffered through not great cake? Many, many times, I can guess, between us. Wouldn't it be brill if someone actually featured something other than cake at a wedding? Hmmm….now that would be interesting. Now, don't get me wrong. I lurve cake. All shapes and sizes, all flavors…buttercream-filled, mousse-laden, jam-laced, gluten-free chocolatey goodness…and the list goes on. But I am not everyone. And not everyone loves cake. 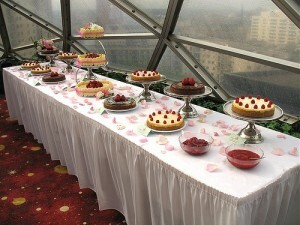 Imagine a world in which you could serve your very favorite dessert at your wedding. Well – welcome to that world. And consider your options. Okay…so you like cake…a little. You just want something different. Did you know that you can make a cheesecake into a wedding cake? Oh, yessireebobby. In fact, there are cheesecake bakeries that feature such confections. We totally think you should have a cheesecake wedding cake, and we totally think you should invite us to the wedding if you do. Think different cheesecakes for different layers. And who needs frosting? Fruit glazed, or even whole fruit, fruit-tart style, would be simply gorgeous. When's a cake not a cake? When it's a trifle. Here's another idea. 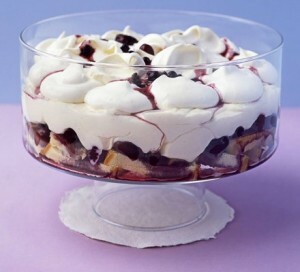 If you like pudding and cake combinations, imagine a table that features different trifles. A traditional English dessert made of cake, fruit, pastry cream (think pudding) and liberal amounts of liqueur or sherry, trifles are traditionally served in beautiful glass bowls that allow you to see a cross section of all the yummy goodness. Envision a table with a rasberry chocolate trifle here….a coconut macaroon-Grand Marnier trifle there…and maybe a strawberry shortcake trifle smack dab in the middle. Seriously. Cake Who? And then there's the pie crowd. For an outdoor or rustic barbecue, or picnic-style reception, we simply cannot think of a better wedding cake alternative. Most fruit pies are super sturdy, and will stand up to your hottest July sun, whether you're in Wisconsin or Texas. And if your tastes run to the creamy or chiffon – key lime or lemon meringue anyone? How about banana or coconut cream? 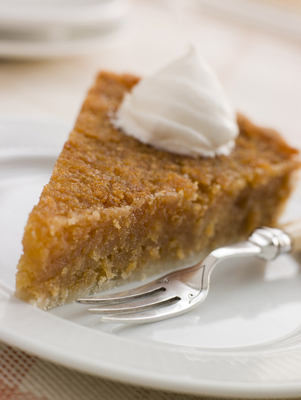 Or serve pumpkin with a pecan crust for a November wedding. People will talk. And it will be all good. So, what if you aren't a dessert person? Well, again…your wedding. You don't want to serve dessert? Then don't. There are plenty of creative businesses out there who offer savory alternatives to sweet confections. Consider a “wedding cake” made out of various wheels of cheese, surrounded by breads, crackers, and mounds of fresh fruit. Or think about a cake made of meat pies. Yum. Yum. Yum. Hopefully, we have given you Non-Cake Lovers out there a think or two to think about. Never has there been a better time to get married, if you crave a little individuality. So go for it. And please. Send us pictures.